My family of 12 had the pleasure of staying in this lovely Villa during our week in Tobago. We were highly satisfied with our stay. The owner, Les, was very prompt and professional through the reservation process. Upon arrival, Stacy, the house manager was kind and welcoming. Stacy and June took excellent care of the Villa while we were there and made it feel like a home away from home. For a group of 12 (7 adults/5 children), the Villa was comfortable for everyone and my family hated to leave. The layout of the floor plan was really nice because the rooms were spread throughout the space, so we did not feel like we were on top of each other. The common areas were very comfortable. We spent most of our days on the veranda watching the children (and some adults) enjoy the pool. Stacy and the staff were unobtrusive performing their daily duties, yet warm and friendly. 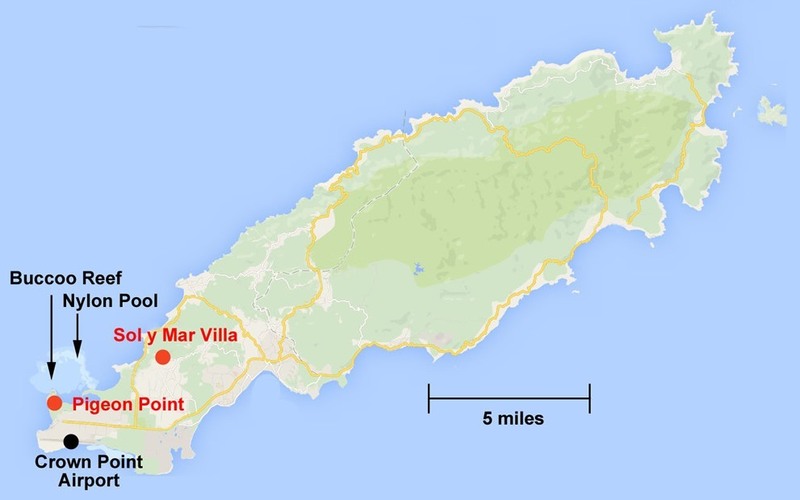 The Villa was located within a few minutes of Store Bay and Pigeon Point. Overall, I highly recommend this Villa for large families and my family would definitely stay here again. My family and I went to Tobago for a beach wedding and we stayed at the Sol Y Mar Villa. This villa is amazing, the pictures did not do it justice, it is everything and more. Its clean and comfortable, very windy which is great for the hot days and the pool and hot tub is a must. We enjoyed our stayed there but was sorry we did not stayed longer this we will fix on our next trip there. The housekeeper Stacey is so nice and kind, she made us feel welcome as if we were family, we all felt very comfortable. This villa house 12 people, but it did not feel like it because it is very spacious and everyone had their own room and bathroom. I cant say enough about this place, I will and have already recommended this villa to my friends and family and I look forward to my next visit. our stay at the villa with my siblings and nephew for 4 days was amazing, the hot tub and the pool was enjoyed by all until late in the night, the villa and the surroundings was very clean and well kept by the gardener and Stacey who were very friendly, we enjoyed the large outdoor space especially my husband his place was the gazebo. It was well equipped, just bring your food, bedrooms were large and with ensuite bathrooms, would definitely stay there again and recommend to friends and family. Our stay at Sol y Mar was Absolutely wonderful. the house itself was very well kept as well as the pool. it is very kid friendly perfect for families. definitely will return. Very gorgeous property..amazing view and already recommending people. It was lovely..couldn't ask for a better house..
My husband and I recently stayed at Sol y Mar with 4 other couples. The accommodations are extremely comfortable for 5 couples with amazing views. We all preferred having dinners at the villa instead of going out. We also enjoyed bird watching from the front porch and pool area in the morning and afternoons. There is excellent maid service as well with a spacious kitchen and large dining table. There is a lovely beach just down the hill if you do decide to venture out. Will definitely return. Exceptionally Wonderful!! I begin with the owner's very prompt response to my request for a tour at the villa before making my decision. He gladly arranged with Stacey for my visit. Stacey was welcoming from the moment we met. There was no further hesitation on my part to chose this villa. The owner was ALWAYS prompt on responding to all of emails. I was truly impressed by the customer service. We could not ask for anything better. Our stay was only three days and two nights, but there was absolutely no issue at all. ...just memories and wishing to return. June was there to ensure the villa was well kept but she did not intrude in our privacy. Keshorn came very early each day and attended to the pool, jacuzzi, garden, patio. Everyone was sincerely friendly. We were a group of 5 families amounting to 12 of us. We thoroughly enjoyed ourselves. In the morning, it was a pleasure to find such a variety of birds visiting and apparently glad that we were taking photos of them. The bedrooms afforded all to the privacy of an ensuite bathroom. The kitchen is huge and has all the utensils that you can imagine - various sizes and materials. The living room is very cool and inviting. The porch is very relaxing and the right place to bond with each other. The gazebo is amazing for the lovely ocean view and fresh breeze. The pool was inviting to all, just a need to be careful with little ones at the deep end. However , there is a small children's pool which was used for the 4yr old in our group. The jacuzzi was the icing. Girls and boys had their turn respectively, with no one wanting to leave. The upper loft is a also a very cozy and homely space for watching tv at one end or wanting to study at the other. When it was time to leave, one of us wanted to leave...we all felt that we should have stayed longer. We even counted seating for about 58 in and out of the villa....it is really a home away from home. We also felt comfortable with the security system. 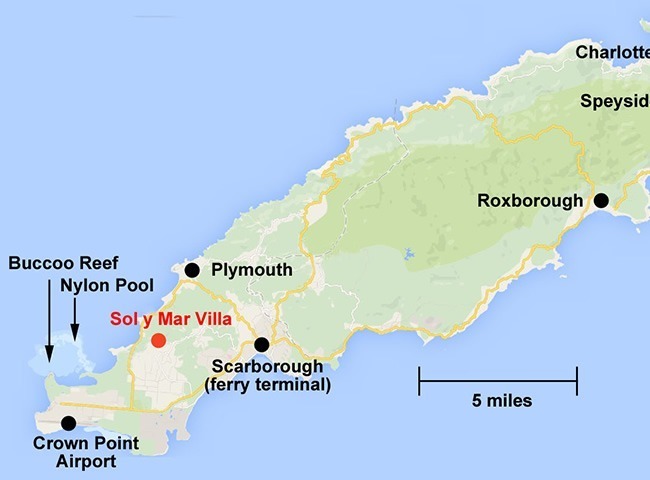 There is no doubt in my mind my next overnight stay in Tobago is going to be at Sol y Mar. My dad especially appreciated the fact that someone would build such a lovely home with all its amenities, in and out of the villa, and be so willing to share their home with strangers. At our departure, Stacey shared some background info about the owners which we appreciated very much. We kept talking with Stacey and really did not feel like leaving the villa. I am writing this review at work and just wishing that I was at Sol y Mar in the pool. My husband and I, along with 2 other couples, vacationed at Sol Y Mar Villa last week and had an absolutely wonderful experience. The villa is very well appointed and the views are even more picturesque than we anticipated. The villa is quite spacious and the veranda/pool area were the perfect place to relax and enjoy the birds and other wildlife. The owners were incredibly helpful and responsive with island recommendations and the housekeeper, Stacey, was a lovely person and excellent resource. I would also highly recommend our driver, Mr. Tito, as he went above and beyond to make us comfortable and set up many tours for us. If we are lucky enough to return the hidden paradise of Tobago, we would absolutely stay at Sol Y Mar again! A spacious well lay out beautiful Villa. Our stay was awesome. The Villa is very comfortable it was a memorable vacation. Stacy/June and Carlos was very pleasant and helpful and made out stay very comfortable. We do look forward vacationing there again. We were a group of family and friends, from TT and England, who had a fantastic stay at Sol y Mar. Outstanding villa, beautiful views, great pool and jacuzzi, everything you need for cooking. It feels like being in an exceptional home, much better than most villas where you get the bare minimum of plates, glasses etc. Also, extremely comfortable without being ostentatious. Great service from friendly housekeepers Stacey and June, and Keshorn who took care of the pool and garden. We all loved it and vowed to come back. Our family had a fantastic time in Tobago. The Villa was more than expected, truly a home away from home. We were all comfortable, felt safe and secure, all enjoyed the pool, hot tub, the serenity lounging around in the back relaxing.....priceless!!. Your staff: Mrs. Stacy, Mrs. June and Mr. Keshon were welcoming, warm, courteous and paid attention to details, very respectful, it was a pleasure meeting them. Planning to come back in 2018!! Our family had an enjoyable and comfortable stay at the Villa. Spacious living areas, large kitchen with everything needed to self cater including a BBQ grill, pool and jacuzzi, and gazebo overlooking the Buccoo Bay were highlights for us. Our stay at the Sol y Mar villa was truly amazing. We booked this villa as a post Carnival "cooldown", and it surpassed our expectations. This beautiful villa is located in a quiet neighborhood, on a hill with a breathtaking view of the ocean. As we arrived at the villa, we were greeted by Stacy, the villa's extremely pleasant Housekeeper, who took us on a tour of the villa. It was very clear that the owner, Les, takes pride in the property as it was very well maintained. From the bedrooms, which each had their own bathroom, to the sitting area upstairs with a wide variety of books, to the pool, hot tub and Gazebo; everything was in excellent condition, and we immediately knew we made the right choice. Everyday Stacy came and made sure we had fresh clean sheets, towels, including beach towels and made sure we connected with a taxi driver to take us to the different beaches and attractions we wanted to see. She also made us a delicious dinner, which actually lasted us two days. It was such a treat to wake up every morning and have coffee while taking in the awesome views. The only negative thing about our trip was that we did not book a longer stay at this villa. Many thanks to Stacy for making our first trip to Tobago a truly memorable one. We will be back soon. We took the ferry to Tobago as a group of hospital staff seeking for a retreat from the intensity and pace of working on a demanding hospital ward. Sol y Mar provided the opportunity for us to relax completely and enjoy the only weekend that we had off. Dr. Leslie Organ was kind and provided us with information that was necessary and the housekeeper Stacey was courteous and very helpful. This location is perfect for all those who are seeking solace and relaxation with family or friends. I recommend Sol Y Mar to anyone who wishes for that peace and quiet, scenic and breathtaking views or plain privacy. Memorable week at Sol y Mar!! Our decision to spend a vacation week in Tobago at the Sol y Mar Villa is one we will treasure for a very long time. Our week began with Stacey's very warm welcome and tour of the Villa. We loved the spaciousness and layout of the nicely decorated villa; so many seating areas to use that we could all gather together in one area or in smaller groups if we chose to, sharing our meals both indoors and outdoors! The kitchen was well laid out, there was every type of appliance and kitchen utensil we needed to use, with all in good working condition. We enjoyed the lovely views of the ocean and countryside, watching the setting sun at poolside was nice. Sipping a glass of wine in the jacuzzi as the sun was setting was oh! what an experience!! Having a security system at the Villa provided us with a sense of safety throughout our stay. Stacey (housekeeper) aimed to please, always very helpful, wanting to be sure we enjoyed our vacation, responding promptly to our questions, etc. Working alongside her were June and Keishon, who were also very helpful all week. They were a great team maintaining the Villa, making sure we were comfortable whilst keeping the Villa and beautiful surrounding landscape clean all week. We were also very satisfied with Les' (the owner) responsiveness to our many questions - questions we had before our stay as well as during our week at the Villa. We were a group of 12 lovely Ladies, young at heart, friends from High School vacationing together, building memories..... And would we consider a return stay at Sol y Mar if visiting Tobago with family or friends, most definitely!! The Villa is truly a "home away from home"! A True family vacation home. Families would enjoy spending time at this Villa. Everything, from the grounds, the interior and exterior of the home was immaculate and beautiful. Stacy, the housekeeper was genuinely friendly and ensured that we were comfortable from the start of our vacation to the time that we checkout out. The linens in the bedrooms and the en suites were all very clean. The kitchen was big and supplied with all the dishes and cutlery that you would find in your own home. The location is close to the supermarket and to the beaches. The view from the Villa is magnificent! Yes, your can see the ocean from the Villa , you can also find a perfect view of the reef as well! Bird lovers would appreciate the frequent visits of the humming birds and other species throughout the day. The Villa also provides a handbook about birds to help you identify the type and name of each! The kids loved the pools and we all enjoyed the jacuzzi especially at nights. The WiFi worked great throughout the compound so , both kids and adults were happy. However, we were even more delighted to find a library in the loft with a great selection of books with familiar authors that we love to read. While you move throughout the house you would notice beautiful art pieces on the walls and tables, specifically selected and placed in each room. One night in the cool living room area, we found an album filled with pictures of the owner, allowing us to see and appreciate her gifted talents and her life. We felt happy to stay at her home. We felt at home and hope to visit again soon. Our experience was wonderful. Our stay at the villa was everything we hoped for. The advertisement was in no way misleading.The accommodation was very comfortable and safe with everything we needed and breath-taking views made our stay very relaxing.The complimentry meal was a wonderful surprise.The caretaker, Stacy was also very warm and extremely helpful. I will therefore highly recommend the facilities to any group. I guarantee you will have no regrets. My wife and I held a mini family reunion with each of our extended families over 10 nights at Sol Y Mar. The positive reviews I read before making the booking were all well deserved. The house was more than large enough to accommodate everyone comfortably and I thought it was very well designed with its open living area leading out to the large outdoor patio and beautiful pool. The design provided a large central area for the family to be together without feeling overcrowded. The house itself was full of the Caribbean charm that one would expect from a Tobago vacation and felt truly authentic. The unique layered pool also proved to be a hit. The shallow kid friendly section allowed the adults to stay close enough to their toddlers without having to stay in the shallow area also. The picturesque landscape coupled with the position of the pool and gazebo (facing the sunset) is spectacular. Finally I have to mention the house manager, Stacey. She was very professional, friendly and accommodating and did everything she could to make our stay perfect. Would definitely recommend this place to anyone looking for the perfect Tobago vacation and hope to return myself someday. 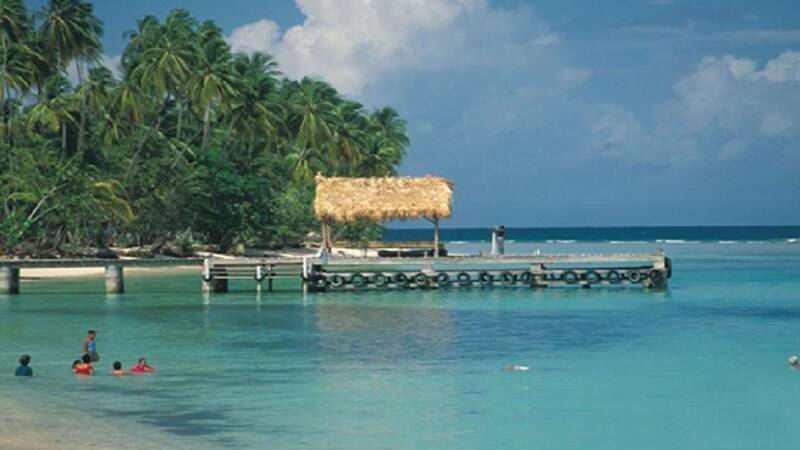 To say that Sol y Mar in Tobago is a great place to vacation is simply an understatement! Our time there, and there were 10 of us, was a vacation dream come true for everyone. This part of the world, and especially this piece of real estate, is by far the #1 destination that any of us have been (and we have all travelled extensively). Stacey the house manager certainly added to our fabulous experience, so if you have not been to this property or to Tobago, then you should consider it for your next holiday retreat! thank you Les and thank you Stacey, we will be back!